One On One Flavorings- code DIY-OOORW will give you 25% off entire order I don’t think it has a time frame I was given the code to help promote their site so hope you guys enjoy! Hello, guys! Bring you the good news! 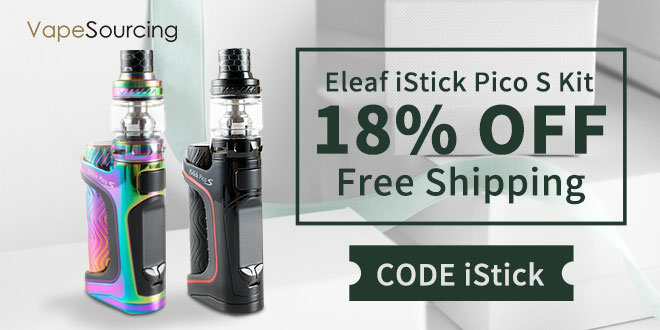 Vapesourcing online vape store offers you the big discount on Eleaf iStick Pico S Kit for 18% price off with the coupon code:iStick. What’s more, this vape kit is also for free shipping. And the valid time is just for only two weeks. First order, first get. 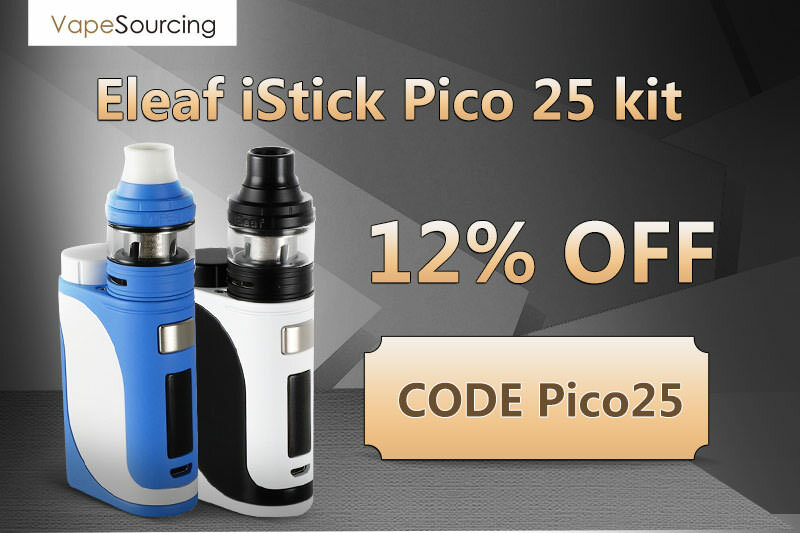 Eleaf iStick Pico 25 Kit 12% Discount Hot On Sale! Hey guys! Here is another piece of good news for you! From now on, when buying the Eleaf iStick Pico 25 kit, you can enjoy a 12% discount with the discount code "Pico25" and it is in stock now. By the way, the discount code will be valid for only two weeks. You won't wanna miss it, just strike while the iron is hot! Another week comes again, and vapesourcing online vape store still choose five kinds of vape devices for the big discount. You can still use the coupon code: Weeklydeal for 25% Price Off. The five vape devices: Geekvape Creed RTA 6.5ml, Suorin iShare Starter Kit, Vandy Vape Pulse X 90W Squonk Kit, Wismec Luxotic DF Squonk Mod, Joyetech EXCEED NC Kit, and most of them are for free shipping. It’s the best chance to get one here: https://vapesourcing.com/special-price/weekend-deal.html. Guys, good news from Vapesourcing. This time Vapesourcing online vape store also gives you the big discount before Thanksgiving And Black Friday if you need vape devices urgently, such as vape kits, best vape mods, vape tanks, vape RDA and so on. Using the coupon code: VSSale, you can enjoy the discount for 10% price off. And the valid time is only for eight days. In order to celebrate Thanksgiving Day, Vapesourcing online vape store gives you the big surprise again. There is the activity of Wheel of Fortune for you to win the prize. Using the coupon code: ThanksGiving, you can enjoy the discount for 12% price off on the whole site. Just recently became an ambassador for Real Flavors and wanted to let you all know if you use "TheMacroDiabetic" at checkout you'll get 10% off your order (also applies to their Hip Syrups Line). Additionally, this coupon doesn't expire.